HH and the Boys: New toy on Monday.... what could be better? Before we share that news. 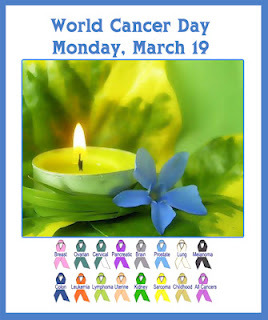 Just a reminder that it's World Cancer Day... We are remembering and sending purrrrs to all those who have been affected by it. OMC... such excitement at our place this weekend. 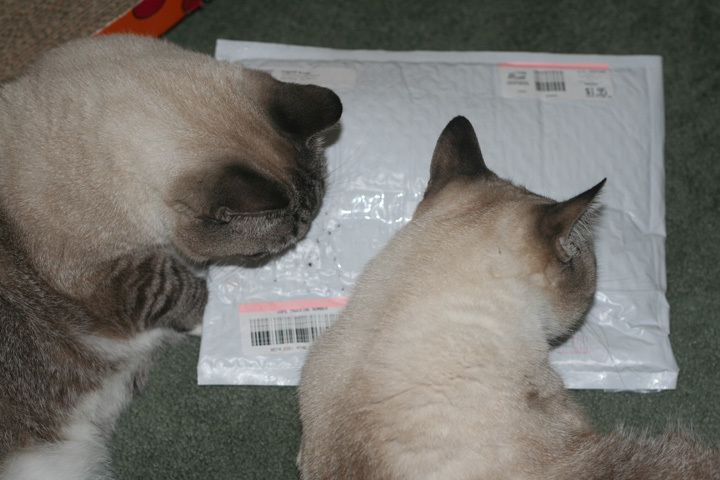 The boys received their prize package from The Conscious Cat. HH saved it for a couple of days until Knuckles was feeling all better. Then she let them have it. The boys are checking out the package. I think they are catching a bit of Allegra and Ruby on the package. 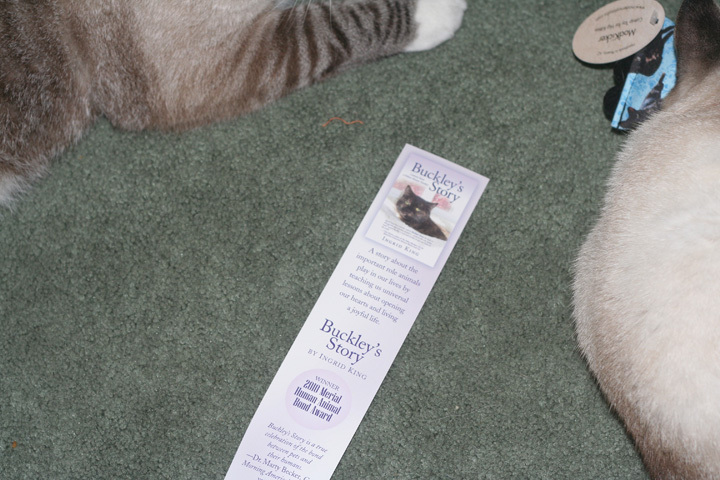 The first thing that popped out was a bookmark for Buckley's Story by Ingrid King. Did you read it? It's great! 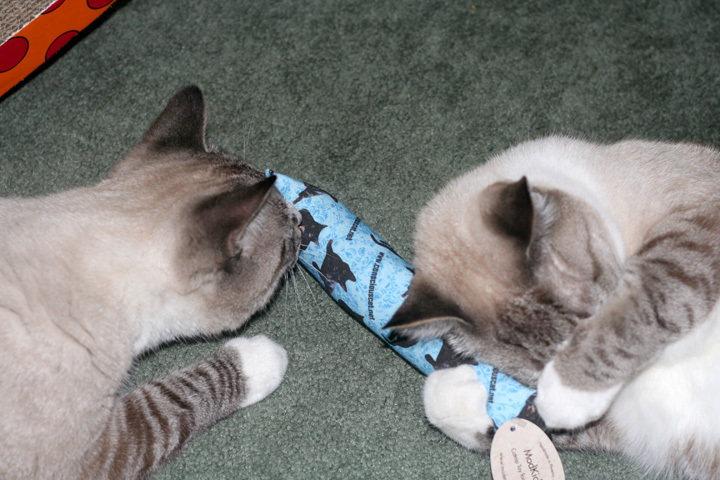 OMC the boys were so excited to receive an original Conscious Cat ModShaker that they even did a great job of sharing it. Thank you, Thank You, Thank You to Allegra, Ruby, and Ingrid. We love our new toy. PS saw you at Zoolatry and mum loves your work..
Oh boys that looks like fun!! And most of all it is very complimentary to your furs and eyes. we are purrin too....we hope one day soon there is a cure! What a great toy - glad you boys are sharing! That toy looks grrrreat to me too! Ooooooo, dats a cool toy! And oh my goodness, everybuddy be sharin' too! Cool! So glad dat Knuckles is all betters nows. That must be a truly excellent toy if you are sharing it!! Today is a day of prayer for all that are fighting this evil thing! Wow - that's going to keep you entertained for hours and hours. Looks like a very popular new toy. Very nice that you shared too. That Mod Shaker looks like it's going to be a favourite toy. Gosh, that looks like a fun toy! You know, I sometimes fancy myself a little nip, too! Is that wrong? That really is a wonderful present! We must defeat the evil cancer monster! I is thinking, that toy mite has some of the nip in it! And wot a pawsome toy it do be. And long enuff for the sharing, too! Those Modshakers are awesome toys - what a great prize! That looks like a pawsome present! You two are so cute! What a cool toy! We bet that it helped Knuckles feel better!! I'm so glad the boys like their toy, and that it's big enough to share. oh Dog! What an awesome prize!